Magnet Attachment 0.28x / 180° Fisheye (+ Macro) Lens for iPhone / iPad / Samsung Galaxy Phones : allputer.com - Accessories for all your Portable Electronics & Computers! The accessory help you take pictures / shoot movies with your portable electronics with a built-in camera as other professional cameras / DSLRs do. The mechanism is so simple, if your device's back plate is Magnetism, then what you need to do is just stick on lens on the front of the camera then you can use this lens, if your device's back plate is not a magnetism e.g. iPhone 5 / iPad 4 / Galaxy Note 2... just put the included metal ring in front of the camera and stick the magnet-terminated lens to the metal camera, then you can use this lens too. The metal ring is applicable to all our 13.06mm magnet attaching lens in our shop. 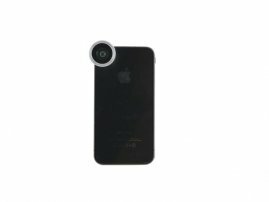 - A super easy way to widen your viewing angle up to 180 degree and a 1.25X Macro lens. No need to assembly, just stick the ring on, stick the lens to the ring and unstick from your device's lens after finishing taking pictures.